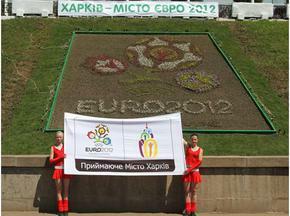 On the 7th of June, just 2 years before Euro 2012, a logo of the host city has been presented in Kharkov. Local Organising Committee Euro 2012 together with the representatives from the government and local authority introduced logo of the host city and a flower bed with the logo design Euro 2012. The logo of Kharkov is a mirror stream, which is one of the modern symbols of the city. It was presented together with grand opening of the flower bed in the center of city. The flower bed with the logo design Euro 2012 symbolizes a bright football festival and it will remind the residents of the city as well as visitors about the upcoming of the biggest sport event in Ukraine. Preparation for Euro 2012. Will we see a bus station by Boryspil airport? The Cabinet of Ministers of Ukraine instructed mayors of host cities for euro 2012 to build bus stations by the airports. Vice Prime Minister Kolesnikov told the National Television Company “Ukraine” about this. Mr Kolesnikov said that they had instructed mayors of four host cities to build bus stations by the airports. But at the same time he pointed, that there is a complicated issue about Boryspil airport, in Kiev. The reason is that the land from both sides of the main terminal is private. We will keep you inform how the things will resolve. Stay with Freelance Translation Studio! The UEFA Supervisory Board has confirmed the right of all four Ukrainian cities to hold the Euro 2012 European Football Championship. It was explained that over the past two months dramatic changes have took place in the preparation for the championship, especially in terms of development of infrastructure, so UEFA will not reduce the number of host cities, the Ukraine 2012 information center reported. Ukrainian Vice-Premier Borys Kolesnikov visited UEFA headquarters in Geneva on Wednesday to attend a meeting of the UEFA supervisory board on Euro 2012 issues, his press service has reported. “Fifty-two days have past [since the previous meeting], and I think we have something to show. We have made significant progress at the airports in Donetsk, Lviv and Kyiv. I can say that the president and the government, as well as all people participating in the project, i.e. contractors, have done everything they possibly could,” he said. Kolesnikov also said that Ukraine was gradually getting back on schedule in terms of construction work. “I really hope that significant changes will already be visible as early as August and September. This is particularly noticeable with respect to Kyiv, Lviv, as well as Donetsk Airport,” he said. Do you plan to visit Euro 2012 in Ukraine? We can help! Contact us! CIS languages – what is it???? CIS languages, what is it, you might ask. CIS languages are the languages of Commonwealth of Independent States (CIS), former USSR countries. The organization was founded in 1991. Right now it includes Armenia, Azerbaijan, Belarus, Kazakhstan, Kyrgyzstan, Moldova, Russia, Tajikistan, Turkmenistan, Ukraine, Uzbekistan. The most widely spoken language in CIS countries is, of course, Russian. At the time of USSR it was a state language of all Soviet Republics. Today Russian is still widely used in the CIS countries. E.g. in the Eastern part of Ukraine 98% of the population speak Russian, though all the official documents are prepared in Ukrainian. Western part of Ukraine is solely Ukrainian speaking. In the epoch of globalization it is quite easy to find an agency or a company offering translation services into CIS languages, i.e. translation from european and asian languages into Russian, Ukrainian, Kazakh, Armenian, Azerbaijan, Belorussian, Georgian, Kirghiz, Moldavian, Tajik, Turkmen, Uzbek. Among them is Freelance Translation Studio. This is one of the leading translation agencies with more than 200 highly professional Armenian translators, Azerbaijan translators, Belorussian translators, Kazakh translators, Kirghiz translators, Moldavian translators, Russian translators, Tajik translators, Turkmen translators, Ukrainian translators, Uzbek translators utilizing the cutting-edge technologies. What are the world’s most widely spoken languages? If I were asked, I would put Chinese on the first place as there are 1.3 billion of Chinese people (this is 22% of the whole population on Earth). So it looks if one knows and speaks Chinese, then he/she can communicate with every fifth inhabitant on the planet. But unfortunately they live far away. Using the same principle I would give the second place to the second most populated country – India. What kind of language do they have there? It seems to me hindi? Though I’ve never come across any writings in hindi, but the billion inhabitants should communicate with each other somehow. The third place I would give to English. Lots of people study it at school, colleges and Universities. Fourth is to Spanish, as besides Spain almost the whole Central and South American speaks it. The Fifth is to Russian. Though Russians are the only one who speak Russian, but it used to be the language of the biggest state – USSR. 4. English 341,000,000 – Australia, Belize, Botswana, Brunei, Cameroon, Canada, Eritrea, Ethiopia, Fiji, The Gambia, Ghana, Guyana, India, Ireland, Israel, Lesotho, Liberia, Malaysia, Micronesia, Namibia, Nauru, New Zealand, Palau, Papua New Guinea, Philippines, Samoa, Seychelles, Sierra Leone, Singapore, Solomon Islands, Somalia, S. Africa, Suriname, Swaziland, Tonga, U.K., U.S., Vanuatu, Zimbabwe, many Caribbean states, Zambia. Quite interesting, but it is quite visible that there are neither Tatarian, Kazakh, Czech, Hungrarian and so on that we meet quite often during the day. But on the other hand there is a big list of India’s languages that we do not use at all.